Progress is being made on Christchurch’s nine suburban master plans, with a number of projects either under way or completed and others in the pipeline. “The master plans are helping to support the rebuild and recovery of the most damaged suburban commercial centres,” the Council’s Head of Urban Design, Regeneration and Heritage, Carolyn Ingles, says. The suburban centres master plans cover Edgeware Village, Ferry Road, Linwood Village, Lyttelton, Main Road, New Brighton centre, Selwyn Street shops, Sumner Village and Sydenham. The priority projects have been set by local Community Boards. Some key projects are already completed or under way for each master plan. Funding to deliver additional projects across the nine master plan areas has been allocated in the Draft Long Term Plan and the timing of these will be confirmed when the Long Term Plan is adopted in June. A parking survey has been completed in Edgeware Village and transitional history display boards have been reinstated as part of the supermarket development. Transitional bike stands, seating and planting installed outside the pharmacy continue to be supported by the community and business owners so will remain in place. Ferry Road capital projects have commenced with streetscape planning through Woolston Village. Work has also started on an impressive new community facility, which is due to open in mid-2018, and progress is continuing on the Rapanui – Shag Rock major cycleway. Community groups are working with the Council to bring the area to life in Linwood Village. Following improvements to Doris Lusk Park, work continues on a community garden, play space and performance area in Stanmore Road, and the Council-funded Tiny Shops will soon be in place. A private sector led mixed-use development on a Worcester Street-Stanmore Road corner site is also planned. 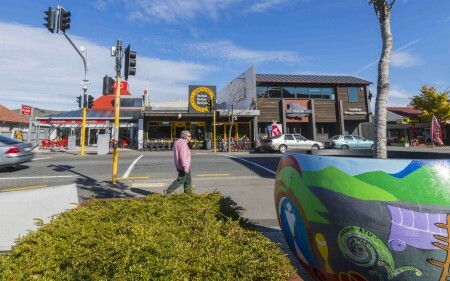 Several marketing and branding initiatives and the installation of more wi-fi spots has been completed in Lyttelton, along with resource consent approval for Stage I of the Te Ana marina development. A demountable fence to enable off-season access to the pool grounds will be installed soon. Moves are under way to promote Recreation Centre use and a new street art mural has also brought fresh vibrancy to the portside town. Many business-related actions have been completed for the Main Road Master Plan, along with community hubs at Mt Pleasant and Redcliffs Library. Attention is shifting to Redcliffs streetscape enhancements and parking and bus stop improvements in Moncks Bay. The Brighton Mall and Marine Parade upgrade is progressing following completion of a design code and the recent successful Enliven Places-funded ‘Tiny Huts’ project. The first stage of the beachside playground is open, while work continues on the proposed Hot Salt Water Pools. Several new business premises have been constructed in Selwyn Street, along with a new church hall. Attention will next turn to renewing the reserve and upgrading the streetscape. The street upgrade through the centre in Sumner Village is scheduled to get under way in May, following recent completion of the new library, community centre and museum (Matuku Takotako) and adjacent courtyard. Street planters are in place in Sydenham, along with extra lighting for a pocket park. A mixed use development is under construction at the former Sydenham School site and the Enliven Places Programme continues to support initiatives in the centre while awaiting funding for permanent works.